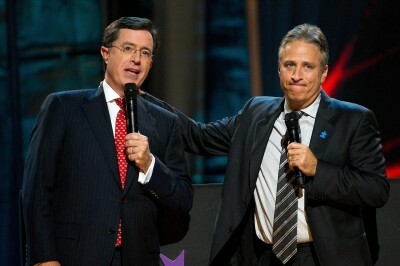 According to Deadline, Jon Stewart and Stephen Colbert have extended their contracts with Comedy Central. The move will keep their respective programs — The Daily Show with Jon Stewart and The Colbert Report — on the air for the next couple years at least. Stewart will continue as an executive producer, writer and host of The Daily Show through the middle of 2015. That will bring his series to 15 years on the air. Colbert will remain as an executive producer, writer and host of The Colbert Report through the end of 2014. That series, produced by Stewart’s company, began in 2005. Both late-night programs recently earned four Emmy nominations and continue to show growth, particularly in the coveted 18-49 demographic. The Daily Show attracts more viewers in that demo than any other late night show currently on the small screen. What do you think? Do you watch The Daily Show with Jon Stewart and/or The Colbert Report? Do you like one better than the other? More about: The Colbert Report, The Colbert Report: canceled or renewed?, The Daily Show with Jon Stewart, The Daily Show with Jon Stewart: canceled or renewed? The Daily Show is an institution and Jon Stewart is the perfect late night blend of Johnny Carson and Walter Cronkite with the respect that comes with it. If he ever leaves The Daily Show, I will most likely drop cable. Two of the best programs on TV. Good to see their contracts extended.